Feel the heat in our tropical Y-genic original print wrap dress. 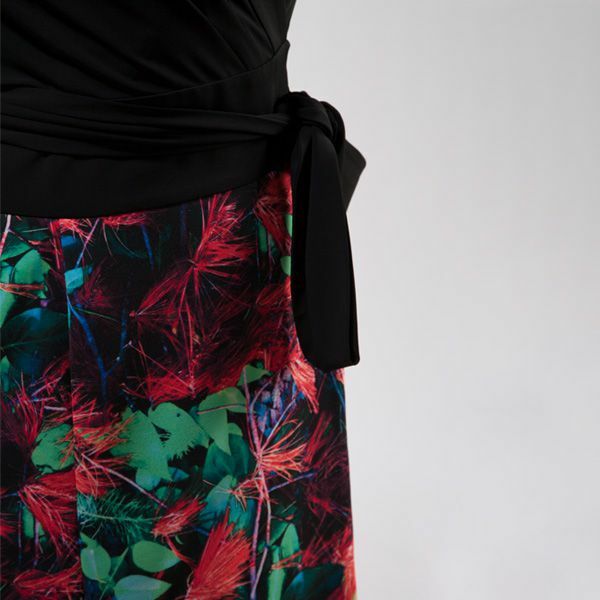 A lush jungle scene with green leaves and red flowers contrasts with the plain black top - capture the look of separated with all the fuss-free convenience of a dress. Pair with a kay me biker jacket for weekend style. Get ready for fuss-free mornings with our stunning wrap dresses - simple tie the waist ribbon your way, and you're ready to go. A sense of depth is created by the black base of this rich nature-inspired unique print. Our special hidden tab and button keep you safe and secure even on breezy days.